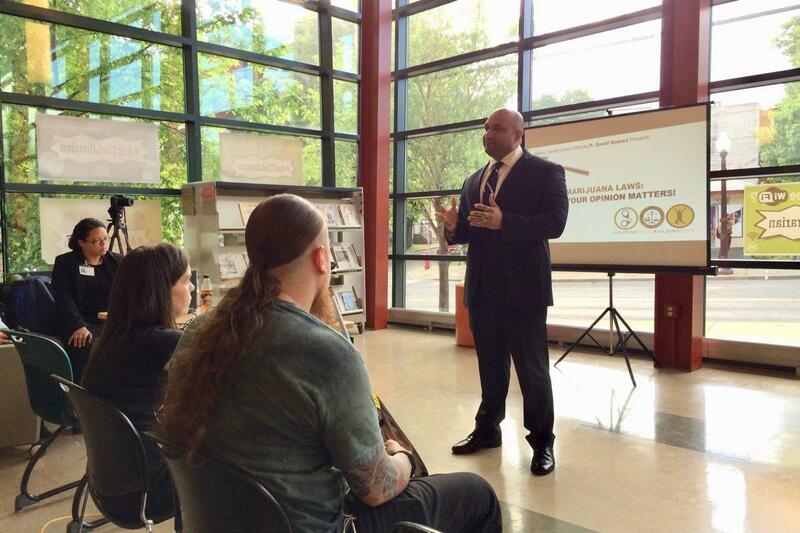 The forum at the Albany Public Library's Arbor Hill Branch was the first in a series of similar upcoming meetings the DA's office has organized around the county. As Soares explained to the crowd Wednesday, he thinks it's just a matter of time until there's decriminalization or outright legalization of recreational pot in New York. And he said now is the time to be thinking about some of the justice issues prompted by legalization and to prepare for the economic opportunities that will come along. "There has to be some form of relief if in 2018 or 2019 we're going to have hedge fund managers who are going to profit from the same thing we were prosecuting people on First Street for doing in years past." "Before we can look forward, I think we have to look back and reflect on what we have done and how we've addressed this in decades past. And the way that we've addressed these issues in decades past is to arrest and prosecute," Soares said. "So there are a number of individuals -- and I'm talking about, historically speaking, 20-30 years of criminal prosecution that we also have to look at -- and say, what are we going to do about those prosecutions, what are we going to do about those convictions? There has to be some form of relief if in 2018 or 2019 we're going to have hedge fund managers who are going to profit from the same thing we were prosecuting people on First Street for doing in years past." Here are a few issues and thoughts that came up during Wednesday's event, which drew about 40 people. A lot of the legal and regulatory issues related to marijuana are on the state and federal level. But there are a few critical points on the local level. And maybe the biggest is this one: A county district attorney has a significant role in determining who faces prosecution for a crime. Could that happen in Albany County? It sounds like David Soares is open to moving in that direction. "First and foremost, if you have a case right now that you're prosecuting that involves the very issues that are being debated and there appears to be some favorability to making legal that which we're currently prosecuting, certainly exercising that discretion to address the future harm now is certainly something that we want to do," Soares said after the meeting. "But before we commit to a framework we definitely want to hear from the people. It has to be a decision that is made by the various communities that we exercise jurisdiction over it. But prosecutors can in fact do something about the issue and they can do it now." Soares said one of the things he's hoping to learn from this series of meetings is where people want the line drawn for prosecuting marijuana possession. Should it be a small amount? Or a lot more? 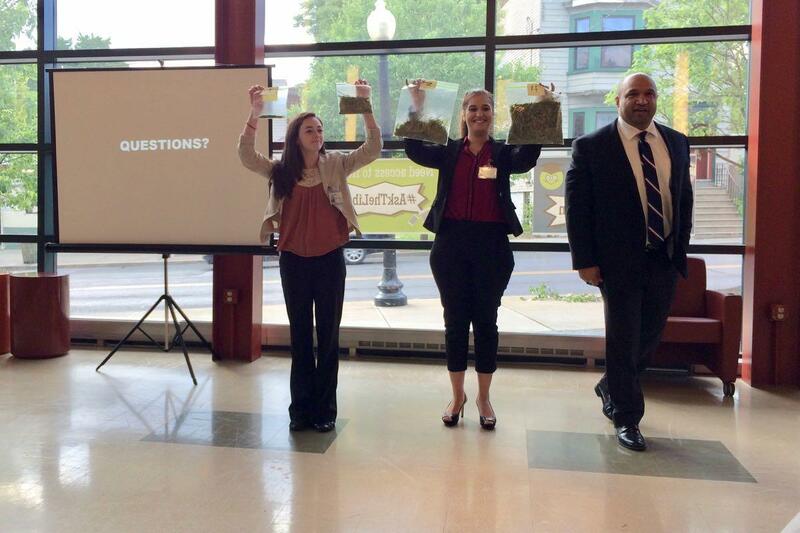 During Wednesday's meeting he had law students hold up bags depicting various amounts of marijuana as a way to prompt people to think about the limit. We asked him about where he personally stands on the issue right now. "I look at it from an alcohol framework," he said. "People who are in possession of small amounts should be able to do whatever they're going to do in the privacy of their own home just like we restrict the consumption [of alcohol] and operating a motor vehicle. We need to make sure that we don't have people smoking and operating motor vehicles. There should be limitations on any kind of public use. And I think that if we apply the very framework that we that we apply now for alcohol I think that's a beginning for market regulation and decriminalization." In their comments during Wednesday's meeting, multiple people touched on a common topic in some way or another: People of color have disproportionately taken the brunt of the war on drugs and the crackdown on marijuana. And there's a lot of pain from that experience. That's played out in various ways. People in one neighborhood getting stopped or arrested for a joint or two, when people in other neighborhoods aren't hassled. The use of possible marijuana possession as probable cause for a search that leads to other charges. Prosecutions, incarcerations, criminal records. And spillover violence from the underground illicit industry. As Charles Robinson -- he introduced himself to the crowd as "one of the notorious Robinsons" (he and members of his family were prosecuted for a marijuana operation) -- put it: "All we've ever been is penalized by marijuana in our community. Forty years of my life I've been penalized by marijuana." "All we've ever been is penalized by marijuana in our community. Forty years of my life I've been penalized by marijuana." One member of the crowd brought up a number that Chris Churchill referenced in a recent column about these disparities: Of the 14 people arrested for nothing other than possessing small amounts of marijuana in the city of Albany this year, all of them were black or Hispanic. Getting all the facts on the table would help the discussion and might even open some eyes. Toward that end, it'd be worth including a breakdown of marijuana arrests and prosecutions over the last decade (or some period of time) in these public forums. And providing aggregate numbers for neighborhoods could help everyone understand which areas have faced the largest toll. Marijuana is already a big business, even if it's underground. The market in New York State is a $3.1 billion industry, according to an estimate from the New York City comptroller's office published last month -- about 2/3 of that outside NYC. So if recreational marijuana does become legal here, it will potentially generate some serious tax revenues. That same NYC comptroller's report estimates sales could result in $570 million in taxes for local municipalities outside NYC (and even more revenue beyond that for the state). At Wednesday's meeting David Soares argued the case to put that money toward an effort to rebuild and repair communities affected by the crackdown on marijuana. "We cannot have market regulation and decriminalization without talking about investment into those communities and the rebuilding of nations," Soares told the crowd. "Every country that we've waged war on, we've engaged in some process of rebuilding their nation. That's what I see that has to happen here in the state of New York." "We cannot have market regulation and decriminalization without talking about investment into those communities and the rebuilding of nations ... Every country that we've waged war on, we've engaged in some process of rebuilding their nation. That's what I see that has to happen here in the state of New York." Soares also drew comparisons to Reconstruction following the Civil War. "I call it urban reconstruction," he said afterward. "If you're looking at post 1865 and the plans that were put in place at the time that we never actually fulfilled. When you think of the inequities, the inequalities that exist right now that perhaps we could have prevented had we done the right thing back then." He prompted the crowed to think about some of the community investment they'd like to see, and then urged them to organize politically in support of them. He said afterward that he'd be willing to take the case to lawmakers at the state Capitol. It's also probably a good idea to keep some perspective on what these sorts of investments might accomplish. The current state of a lot of communities and neighborhood suffering from disinvestment and poverty is the result of a bunch of different factors -- including racism and redlining and environmental pollution and suburbanization -- that have been wound together over decades. The infusion of some marijuana tax revenue could help, but it's not necessarily a comprehensive solution. With all the money that's potentially in play with marijuana legalization, there's also the prospect of jobs and profits. So how do people in communities who have taken the hit from criminalization of marijuana end up sharing in some of the benefits of legalization? Because big investors are already moving into the space and no doubt more are on the way. There are cannabis-focused hedge funds. And John Boehner -- yeah, that John Boehner -- recently joined the board of a marijuana company. At Wednesday's meeting David Soares made a comparison to the craft beverage industry in New York, and briefly mentioned the idea of the state taking measures to keep the cannabis industry from becoming vertically integrated into huge companies. Soares also pitched the jobs and economic development angle as a practical matter: The underground industry is already employing some number of people. And if that business evaporates without other opportunities in neighborhoods, it's very possible people will switch over to moving other drugs, including opioids. So maybe New York should think about a "farm" marijuana license -- like farm distilleries and breweries and cideries -- the can give small producers a foothold. David Soares said he also like to schedule more meetings around the city of Albany. The DA's office has an online survey if you're like to submit feedback that way. I support the idea that someone who has been dis enfranchised/ dis empowered by real time Marijuana laws, should be given an opportunity to benefit from the legalization process. Especially, since it can be argued, that other economic gains are out of reach! Looking forward to sitting back, lighting up a fatty, and watching the sun set one of these days soon. Personally I never tried the stuff but from what I read, pot is not as bad as many people portray it. I support legalization on purely economical grounds. Legal pot trade will divert MASSIVE amount of money from underground economy. As of now, black market pot trade enriches drug cartels and funds drug violence in Mexico but we can totally stop that by legalizing consumption and production of pot. I smoke it when I'm on my cot. I smoke it in the parking lot. I smoke when its cold or hot. I really like to smoke my pot.